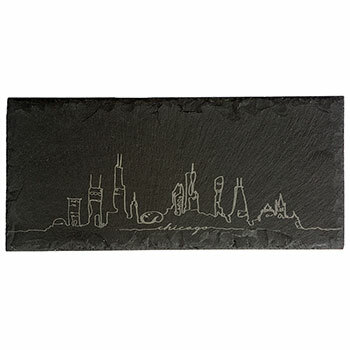 Engraved with the iconic Chicago city skyline, our Cityscape Slate Serving Board is a unique way to serve cheeses or can be used as a trivet or candle-base. From Cloud Gate down the Magnificent Mile, this artist's interpretation of the Chicago skyline is sure to bolster hometown (or new town) pride. A friend subscribes to the NY Times and gives me the Travel and Food Sections to peruse. Read about a clever gift to give/receive and it was the Chicago Skyline Slate Tray and promptly ordered it for a friend who resides in Chicago and works downtown. My friend lives in a small apartment so she loved the tray and has used it frequently. She did in fact order another one and it appeared within days of her order.